In a world awash with coffee, few realise Luigi Coluzzi was one of the men who introduced the espresso to Sydney. In 1957, espresso machines were as common as hen's teeth and the Rome-born barista presented the joys of Italian food culture to the bohemian and theatrical crowd who clustered in warrens around the ABC offices strung along William Street in Kings Cross. Mr Coluzzi and his wife Eleni opened Bar Coluzzi in an old milk bar in William Street. When the building had to make way for the overpass in 1970 they moved around the corner to Darlinghurst Road and their bar became a Sydney institution that has lasted for seven decades. Mr Coluzzi died on Sunday after a short illness. He was 84. He came to Australia as a boxer in 1954 and met Eleni Fonini Stratulatos a Romanian of Greek background, who had arrived as a displaced person four years earlier. She went to watch him fight Clarrie Grogan at the old Sydney Stadium in Rushcutters Bay. He won the fight and her heart. A year later Mr Coluzzi became the Australian middleweight champion. 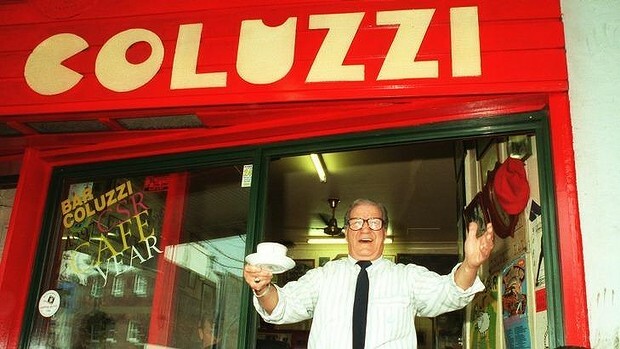 He had been a barrister in Mussolini's Rome during the Second World War and, to stop him boxing, his wife found the milk bar and named it in his honour to cash in on his fame. "It worked. Dad was a lovely, open, charismatic man who people admired and loved to be near," one of his daughters, PaolaColuzzi, said on Monday. Famous people came running, including boxers like Rocky Marciano, and singers like Nilla Pizzi and Domenico Modugno, who wrote the song Volare, actor Danny De Vito and comedian Billy Connolly. Overseas visitors came for the cooking. But the likes of Sir LaurenceStreet, David Hill and other corporate types also came to adopt Bar Coluzzi as their hang. In 1999, the family sold Bar Coluzzi Darlinghurst and opened Bar Coluzzi Randwick. The outlets have now all been franchised but their youngest son, Luigi Junior, has recently opened a new Bar Coluzzi at Circular Quay. Eleni Coluzzi died in 2011. They are survived by their children Paola, Elizabethand Luigi Junior. An older son, Jimmy, died in 1970.